created by Jack Kirby and Joe Simon. A Qoute-I still believe in an America that can rise above this new threat, can bring themselves back from the brink of oblivion, and can stand tall once more. Captain America Uniform: (+1D to physical and energy), Shield: 6D (The shield is made from a unique alloy, one that has survived all manners of damage and things that should've long since destroyed it. Even if damage rolls are failed it is the character that takes the damage in question, not the shield. For the purposes of resisting damage the shield should be considered capital scale (+12D to resist) and has a range of 0-3 / 25 / 50 when thrown. It does Str+1D+2 damage and will return on a successful 'difficult' roll to hit. The shield can be used to attack 3 targets in a single round. ), Comlink. Steve Rogers was born on July 4, 1917 in New York City to Joseph and Sarah Rogers. He grew up frail and sickly, like the poster-child for the "before" pictures in Charles Atlas ads. His father died in 1920, and his mother in 1934. By 1940 Steve was an aspiring artist, subsisting by painting murals on subways for the Works Progress Administration. Steve was horrified by the Nazi atrocities depicted in newsreels, and tried to enlist in 1940. He was judged "4F" by the examination board, and rejected. He was then recruited by General Chester Phillips for a special program called Operation Rebirth. Steve underwent months of tests and training, and was finally injected with the Super-Soldier formula, then subjected to an exotic radiation treatment. The experiment worked; the combination of formula and radiation treatment combined to artificially bring and maintain his body at the highest possible peak of human development. Steve became instantly stronger, more agile, and faster than any Olympic athlete. The treatment also increased his endurance, and also removed fatigue-producing poisons from his system, making him virtually tireless. However, a Nazi spy had gained access to the experiment observation gallery. The spy shot Dr. Abraham Erskine, the inventor of the process, and was himself accidentally killed by Rogers. Over the next week, Nazi spies executed and/or interrogated all of the remaining scientists on the project. 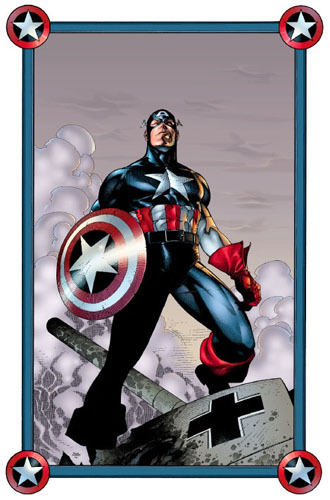 Steve was given the costume and name of Captain America to serve as a symbol, an embodiment of all of the virtues which make the United States great. he was very specifically designed to counter the terror of the Nazi master-agent, the Red Skull. He was initially based at Camp Lehigh, were he met Bucky Barnes. Bucky discovered his secret, and became his partner. Captain America and Bucky fought the Nazi menace alone and as part of the Invaders, frequently striking behind the lines at secret Nazi bases and military installations. near the end of the war in Europe, during an attempt to prevent Baron Zemo I from sending an experimental drone plane to his masters, Bucky was killed in a booby-trap; the blast hurled Captain America into rapidly freezing waters. The Super-soldier formula in his veins prevented him from dying, and he was cast into a state of suspended animation. He would remain in the ice until rescued by the Avengers. Captain America was one of the few costumed heroes left on earth after the Imperial attack squads. He lead the ground forces and helped co-ordinate attacks with the Mutt Squad once they arrived on Earth.